This is a recipe from my friend, Jeanne. She just recently gave me the recipe, and I tried it with calico bass, sheephead, and white seabass, and it is AWESOME!! It's fairly simple to make, so try it for yourself! Put fish in large mixing bowl, pour lemon juice, and put the other ingredients in the bowl, and mix well. Then, put the fish in the refrigerator for 10 hours, or overnight is fine. Once fish is thoroughly cooked, drain but save some juice, and set the extra juice aside. Put the fish back in the mixing bowl for the rest of the ingredients. Cut the green chilies and pimentos (if necessary for pimentos - they should come chopped in container). The pico de gallo should be fresh (best thing is to get some from your local Mexican Restaurant or Baja Fresh). If pico de gallo is a little watery and soft, cut up some more onions and cilantro, if you like. Then, cut up the 3 avocados, and soak them in the extra lemon juice for a couple minutes (this way they won't go brown on you). Put the avocados and the rest of the ingredients in the bowl, and mix well. Refrigerate, and consume within two days. Serve with chips (personally, I like the Mission Tortilla Strips) and enjoy! Yum, I will definately try this out asap! I've never had ceviche prepared this way. For sure a must try. Thank you. Once fish is thoroughly cooked, drain but save some juice, and set the extra juice aside. From the below 'cooks' or did you use heat ? Ceviche (also spelled as cebiche or seviche) is citrus-marinated seafood. Its true birthplace is unknown; some believe the dish to have originated in Polynesia, while others claim that it was developed by the Spanish (who introduced it into Latin America along with citrus fruits such as the lime, lemon or bitter orange). Still others claim it originated along the coasts of Peru and Southern Ecuador before the arrival of the Spanish. If such is the case, another acidic fruit—such as Banana passionfruit—must have been used to prepare the dish, as citrus fruits were introduced into the Americas by the Spanish. Many other countries in Latin America have adopted it, with variations. Both fish and shellfish can be used in the preparation of ceviche. The fact that every former Spanish colony has its own version of ceviche gives credibility to the idea that this dish was introduced by the Spanish. It is well known that every ship from Spain was well stocked with citrus fruits in order to prevent scurvy on the long voyages from Spain to America. During these long voyages it may have become popular to "cook" fresh fish using citric juices, as it was a quick and easy way to prepare food. Those who argue for a Polynesian origin believe that the Spanish encountered the dish during their voyages in the Polynesian islands. Afterwards, the dish quickly caught on among Spanish sailors; and gradually the dish spread throughout the Spanish colonial empire, eventually developing into the different varieties encountered today. Those who argue for a Peruvian or Ecuadorian origin claim that the Andean natives used Banana passionfruit before the arrival of the Spanish to prepare ceviche. When the Spanish introduced citric fruits, the natives apparently preferred the taste and began to use limes and lemon to prepare their fish. One hypothesis suggests that ceviche got its name from the word Cebo, the name given to the corvina fish. However, another hypothesis suggests that the name is a cognate of the Spanish word "escabeche" (marinade or pickle), derived from the Arabic term "sikbaj." Yet another hypothesis suggests that its name comes from the Quechua word "siwichi". Ceviche is marinated in a citrus-based mixture, with lemons and limes being the most commonly used. In addition to adding flavor, the citric acid causes the proteins in the seafood to become denatured, which pickles or "cooks" the fish without heat. Traditional style ceviche was marinated around 3 hours. Modern style ceviche created by chef Dario Matsufuji in the 1970s, usually has a very short marinating period. With the appropriate fish, it can marinate in the time it takes to mix the ingredients, serve, and carry the ceviche to the table. In Peru, ceviche is composed of chunks of raw fish, marinated in lime or bitter orange juice (naranja agria), sliced onion, chili, salt and pepper. Corvina or Cebo (sea bass) was the fish traditionally used. The mixture was traditionally marinated for several hours and served at room temperature with chunks of corn-on-the-cob,and slices of cooked sweet potato. Regional or contemporary variations include garlic, minced Peruvian ají limo, or the Andean chilli rocoto, toasted corn or "cancha" and yuyo (seaweed). A specialty of Trujillo is ceviche prepared from shark (tollo or tojo). Lenguado (sole) is often used in Lima. The modern version of Peruvian ceviche, which is similar to method used in making Japanese sashimi, consists of fish marinated for a few minutes and served promptly. It was created by the now deceased Peruvian-Japanese chef Dario Matsufuji, during the 1970s. Many Peruvian cevicherías serve a small glass of the marinade (as a appetizer) along with the fish which is called leche de tigre or leche de pantera. In its classical version, ceviche is a very simple dish consisting of freshly sliced fish (white meat fish is better), freshly squeezed key lime juice, sliced onions, salt and chili (ají, limo, or rocoto). In Panama, ceviche is prepared with lemon juice, chopped onion, celery, habanero pepper, and sea salt. Ceviche de corvina (white sea bass) is very popular and served as an appetizer in most local restaurants. It is also commonly prepared with octopus, shrimp, and squid. In the Philippines, Kinilaw or Kilawin is raw fish cubed and marinated in vinegar or Calamansi juice along with garlic, onions, ginger, tomato and various peppers. In Ecuador, shrimp ceviche tends to be made with tomato sauce for a tangy taste. The Manabí style, made with lime juice, salt and the juice provided by the shrimp itself is very popular. Occasionally one can find ceviche made with various types of local shelffish, such as black clam, oysters, spondilus, barnacles (percebes), among others. It is served in a bowl with toasted corn kernels as a side dish (plantains and pop corn are also typical ceviche side dishes). Sea bass, octopus and crab ceviches are also common in Ecuador. As in all ceviches, lime juice and salt are ubiquitous ingredients. In Chile, ceviche is often made with fillets of halibut or Patagonian toothfish, and marinated in lime and grapefruit juices, as well as finely minced garlic and red chile peppers. Often fresh mint and cilantro are added. In Sarawak, Malaysia - the indigineous Melanau fishermen have a similar dish they name Umai. This comprises thinly sliced raw fish marinated with ‘assam paya’ (a very sour fruit of a wild palm), onions, chillies and salt. It is traditionally eaten with baked sago pellets. In Mexico and other parts of Central America, it is served in cocktail cups with tostadas, or as a tostada topping and taco filling. Shrimp, octopus, squid, tuna, and mackerel are popular bases for Mexican ceviche. The marinade ingredients include salt, lime, onion, chile, avocado, and coriander (known as cilantro in the Americas). Tomatoes are often added to the preparation. In Cuba, ceviche is often made using mahi-mahi prepared with lime juice, salt, onion, green pepper, habanero pepper, and a touch of allspice. Squid and tuna are also popular. 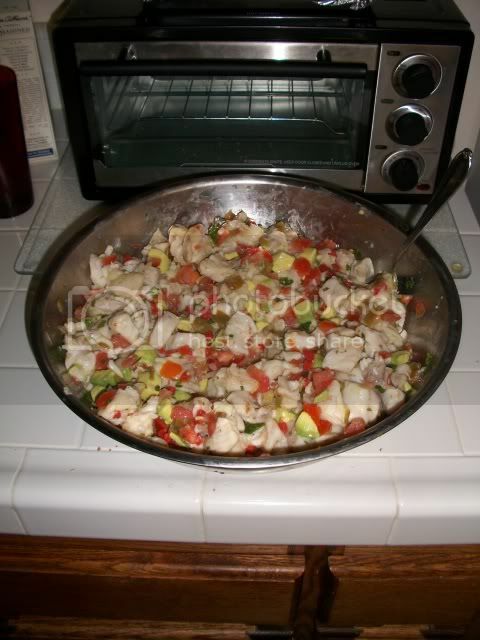 In The Bahamas and south Florida, a conch ceviche known as conch salad is very popular. It is prepared by marinating diced fresh conch marinated in lime with chopped onions, celery, bell pepper. Often, diced pequin pepper and/or scotch bonnett pepper is added for spice. In south Florida, it is common to encounter a variation where tomato juice has been added. In Costa Rica, the dish includes marinated fish, lime juice, salt, ground black pepper, finely minced onions, cilantro and finely minced peppers. It is usually served in a cocktail glass with a lettuce leaf and soda crackers on the side as in Mexico. Popular condiments are tomato ketchup and tabasco. The fish is typically tilapia or corvina although mahi-mahi, shark and marlin are popular. In Hawaii and other parts of Polynesia, a dish which may be classified as a type of ceviche is created using the raw harvested meat of crabs, lobsters, or shrimp, which is shredded in its raw state then combined with Hawaiian chili peppers, lime juice, Hawaiian sea salt, a small amount of soy sauce, tender limukohu sea weed, and chopped roasted Kukui nuts (candlenuts). In Fiji, ceviche is is prepared with lemon or lime juice, mixed with coconut cream and diced tomato, onion, capsicum, and chilli, and served in a coconut shell. It is a traditional Fijian dish that is commonly called Kokoda (pro. ko-kon-dah). The consumption of raw or "chemically cooked" fish, such as ceviche, has been occasionally linked to health problems. For example, the Latin American cholera outbreaks in the 1990's has been attributed to the consumption of raw cholera-infested seafood that was eaten as ceviche. Sounds ok but thats not how you make it..
Well, it tasted awesome and I didn't get sick, so I must've done something right! You ever heard the old saying '' There is more than one way to skin a cat ?" Sure looks very tasty to me !!! no doubt about the hundreds of ways to make ceviche, but they are usually always delicious. thanks for the recipe! YUMM! Sounds good to me!